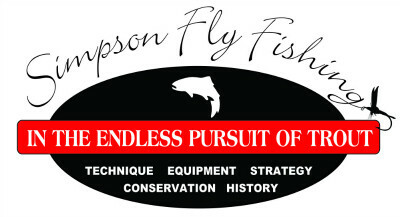 Many, if not most, fly fishers believe that a good cast is most dependent upon the fly rod and the caster. However, I would posit that the fly line contributes as much to the end result as the rod. In addition, once the cast is completed, the choice of line impacts the presentation and effectiveness of the attached fly. Today, major line manufacturers offer 40, 50 or more types of line. In this blog, I’ll explain the major differences in lines for trout fishing, and what they offer the angler. There are four distinct types of lines available. But for the trout angler, there are only two commonly used lines, floating and sinking-tip. Floating lines do just what their name says, they float. Sinking-tip lines have weight built into the front portion, or tip, of the line, which sinks. This helps carry the fly(s) down in the water column, and avoids the need to add spit-shot. The remainder of the line floats. Lines are labeled by weight, measured in grains, running from 1-14. The lower the number, the lighter the line, and the higher the number, the heavier the line. Light lines, #’s 2, 3, 4, are better for casting small flies, and making delicate presentations. They are most often used when fishing small streams, with smaller fish. Heavier lines, #’s 6, 7, 8 are better for casting large flies, like weighted streamers and big, bushy dry flies. They are most often used when fishing larger waters with larger fish. Splitting the difference is the #5 weight line. It can do both fairly well, but isn’t ideal for either. Rod weight, not to be confused with the actual weight of a rod, is matched to the line weight. That is, a 5 weight rod is made to cast a 5 weight line. Some anglers prefer to “overweight”, their rods, using a 6 weight line with a 5 weight rod, etc. This loads or flexes the rod more easily, especially when making short casts. The shape and weighting of the front thirty feet of the fly line is referred to as the “taper”. The taper of the line adds weight to that portion of the line, and aids casting. The remaining sixty feet of line is smaller and uniform. Long, gradual tapers present flies delicately. They present small flies nicely, and are typically labeled as “trout lines”. Short, heavy tapers help cast heavier flies, like hoppers and streamers. They also load more easily, and help with longer casts. Line packages display the shape and length of the taper, and typically describe the line’s best fishing applications. Double taper lines are tapered at both ends. They were in vogue when lines wore out quickly. When a line was showing wear on one end, the line could simply be turned around. But today’s lines wear well, and the primary use of a double taper line now is for fishing small streams. The portion of line between the tapered ends is heavier than that of a single taper line, which aids roll casting. Hence, fishing small streams, with little room for backcasts, is an ideal scenario for double taper lines. Fly lines have generally been manufactured with a smooth finish. But several companies now offer textured lines. They reputedly float better, and cast farther. My own experience is that they retain dirt, and don’t cast as well in the wind. They also make a rubbing sound as they pass through the rod guides. I’m sure they wear off the finish if used for any length of time. They cost more than smooth lines, and I don’t think they’re worth it. When faced with the need to get flies down in deep water, fly fishers have a choice. Put a lot of lead on the leader or into the fly, or use sinking-tip lines. The former solution makes casting more difficult, and has led to the phrase “chuck and duck” casting. A normal length leader with weight at the end has hooked many a caster in the head! Sinking-tip lines are tapered to produce good turnover, and keep flies away from the caster. They cast more easily than floating lines, as the heavier tip loads the rod more fully. A short leader, ~3 feet, is all that is needed. The short leader helps the angler keep tight to the fly, and results in fewer missed strikes. I use these lines preferentially when fishing subsurface flies in water more than 2-3 feet deep. Lines are labeled with a combination of letters and numbers. For floating lines, the first letters differentiate a front taper only (WF- weight forward) from a double taper (DT) line. Next is the line weight, and last is the indication that it is a floating line. Thus, a 5 weight, single tapered, floating line is identified as WF-5-F. A double tapered line of the same weight is identified as DT-5-F.
Sinking-tip lines are more complicated, as they have portions that float, and portions that sink. Thus a 5 weight, sinking tip line is identified as WF-5-F/S. In addition, the sinking rate is provided in inches per second, or IPS. The sink rate generally ranges from 2-6 IPS (inches/second). Slower sink rates fish well in water 3-4 feet in depth, while faster sink rates fish better in deeper water. There are two other lines to be aware of, full sinking and nymphing. Full sinking lines, as their name implies, have no floating portion. They are typically used when fishing lakes or very deep streams, fifteen feet or more in depth. Because of their weight and depth to which they sink, it is best to use longer, heavier rods. Lines developed for tight-line nymphing are the latest to become available. They are heavy enough to help with short, upstream casts, but light enough to reduce sagging of the leader, thus minimizing slack. This leads to fewer missed strikes. As is the case for so many things, “you get what you pay for”. When getting outfitted, there are ways to cut costs, but fly lines is not one that I would recommend. Cheap lines cast poorly and wear out more quickly compared to more expensive lines. Expect to pay $80-90 when purchasing a good fly line. They are well worth it! Each of the lines discussed has a roll in the armamentarium of the prepared fly fisher. Matching them to the fishing at hand helps with both casting and presentation. Thus, I always have at least two lines with me, mounted on separate spools. Spools cost about half as much as reels, and are less bulky to carry. As I encounter different conditions on a stream, I change to a line that helps me fish more effectively. You should too. Tight lines! Written by Al Simpson, December, 2018.